One of our most precious rights as human beings is the right to know the truth. When we know the truth about any particular issue that affects our lives, we can exercise our freedom to either acknowledge and act upon the truth, or ignore and deny it, if we so choose. 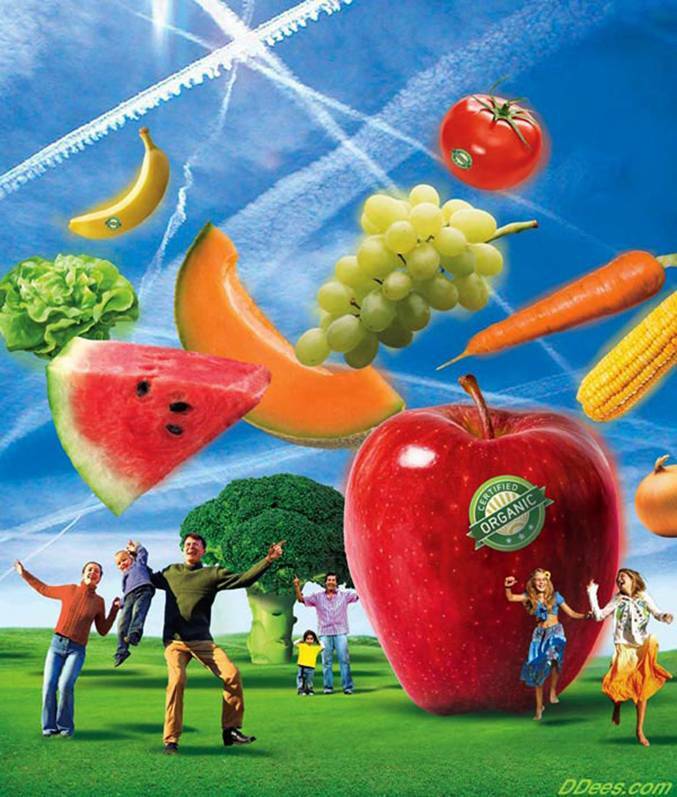 We need to know the truth about what’s in the air we breathe, the water we drink, and the food we eat. These are resources we need to continue living. Why is the Arizona Dept. of Environmental Quality unable to test the particulates in our air? They say they cannot afford the $80 - $150 to capture the particulates in a Hepa filter, and the $100 - $200 to perform an ICP scan to find out what’s in the particulates. This would give them a clue about where the particulates are coming from. They would find out these metals cannot be coming from car exhaust, soft shoulders or dusty fields. And though they cannot afford to run these tests, the state government can afford to pay millions of our tax dollars in fines to the EPA because the particulates in our air, which were not put there by the people in our state, exceed federal environmental standards. *”One CFL bulb in every home is equivalent to taking 1 million cars off the road - 5,000 CFL’s save 1.3 million lbs of CO2” (quote from Defenders of Wildlife and Al Gore. What pure bs! This statement alone identifies these people as liars! We need the freedom to know the truth, to make informed decisions about health hazards associated with these “green” light bulbs. Shut off the heat or air-conditioning in the room, open the windows and leave the room for 15 minutes, allowing mercury vapors to dissipate. If the bulb breaks on a smooth surface, scoop up the fragments with a stiff piece of paper or cardboard and place everything in a lidded glass jar or sealed plastic bag. If it breaks on carpeting, carefully pick-up the fragments. Use duct tape to pick up remaining fragments. Place the tape in a sealed jar or sealed bag. For smooth surfaces, wipe the area clean with damp paper towel or disposable wet-wipes and place it in a sealed jar or sealed plastic bag. For carpeting, vacuum until all fragments and powder are gone. Remove the vacuum bag and place it in a sealed plastic bag. Immediately put all sealed plastic bags with clean up materials in an outdoor trash can. **The next several times you vacuum the area, turn off the heat or air-conditioning and open the windows before you start. **Keep the heat and AC off and windows open for 15 minutes after vacuuming. **High humidity can shorten the life span of CFL, so ventilate the bathroom well if you use them there. 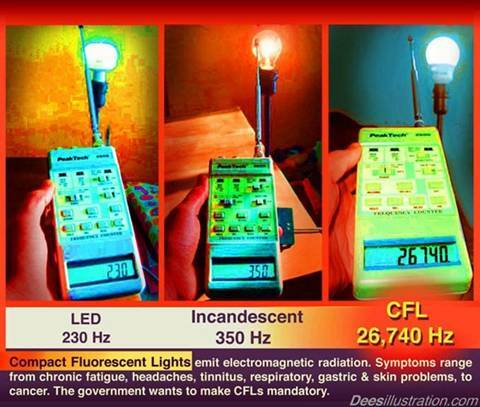 **CFL's are not recommended for use with dimmer switches. The health effect of mercury vapor when inhaled will cross the blood brain barrier, which will deeply and seriously impact the brain's function, but where are the truth seekers? There are agencies in the government, which we put in place to protect our rights, that have the responsibility to protect these vital common resources. But we find that these agencies are not only not living up to their responsibility, but are actually using their power to allow these resources to be corrupted and poisoned, and are even blocking our ability to know the truth about our air, water and food. The truth is that our air contains particulates of various metals in toxic amounts, and these metals are attacking the health and very life of ourselves and our loved ones. There is no need for expensive equipment to measure cubic-feet-per-second of air, to plug into complex super-fund site formulas. Just measuring the proportion of metals in the air particulates is a good tap on the shoulder that something is wrong. 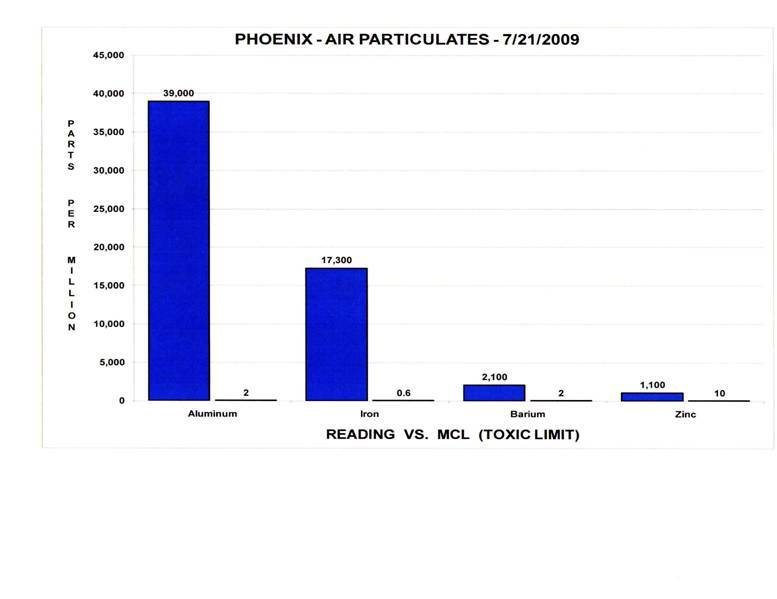 Our measurements of particulates were taken between 3 schools, and the nano-sized particulate metals are being breathed in with every breath by the children walking to and from school. This is a good indicator for their health situation, although they are not keeling over in the street. 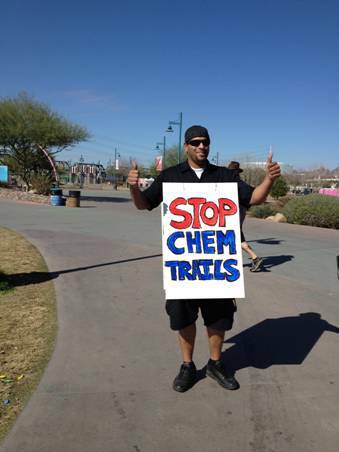 The truth is that barium is known to cause many adverse health effects, including nerve reflex changes, hypertension and high blood pressure, heart rhythm changes, heart damage, muscle weakness, breathing difficulties, paralysis, stomach irritation, swelling of brain & liver, and kidney damage. 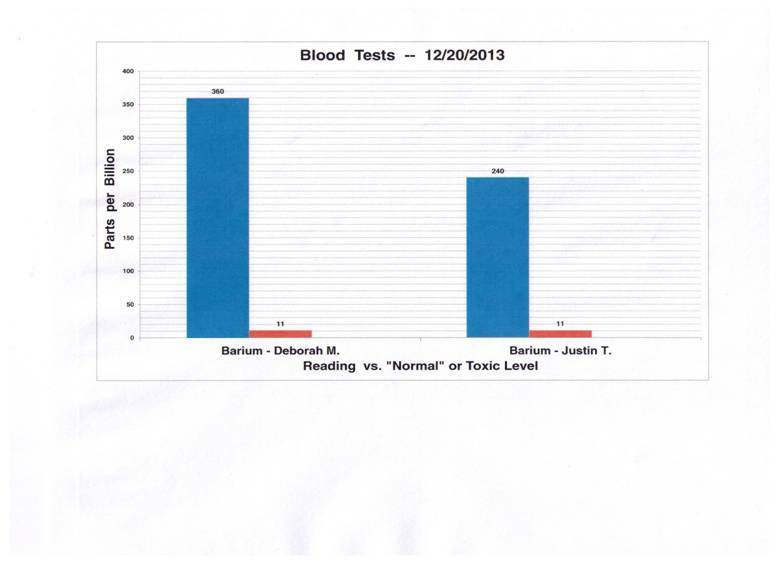 In addition, barium is known to turn off our T-cells and the immune system. Auto-immune diseases and weakened immune systems have proliferated during the past 15 years. 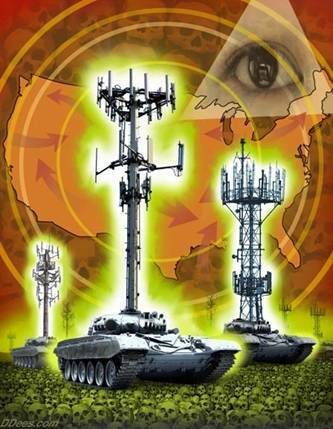 The truth is that the main patent for HAARP explicitly states that barium is the best medium for this directed energy, ionospheric heating system. 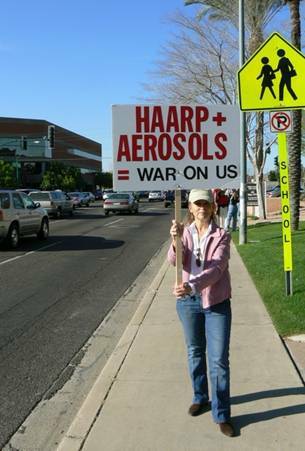 HAARP uses the metallic plasma in our atmosphere to carry its transmissions. This plasma is formed by the non-stop spraying of metallic aerosols in our atmosphere. The Wellsbach aerosol patent mentions aluminum oxide, but from other information sources, like this – (see page 33 for a list of components), we know of 14 or more metals that are contained in these aerosols, most in toxic amounts. 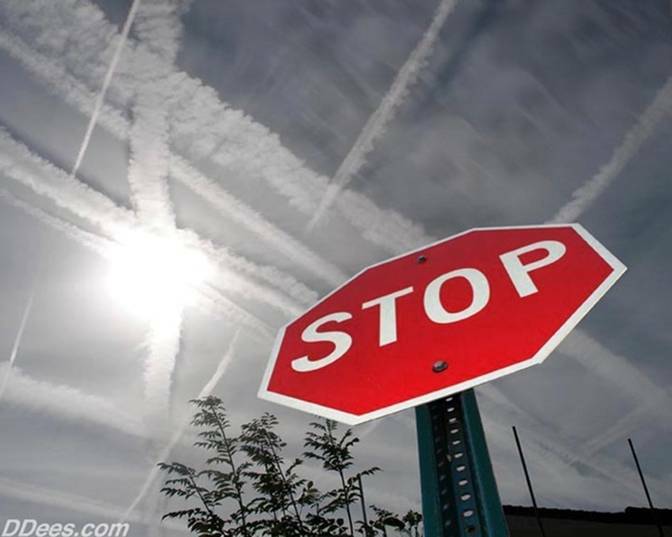 So why are these toxic metals being sprayed, secretly and purposely, into our atmosphere? Are there just some murderous psychopaths running amok? No, as many pieces of this new world system start to appear together, it’s becoming obvious that there is a larger agenda in play, which makes these smaller pieces look natural. There is no need for wild conspiracy theories to understand it, because it all fits together just fine. First of all, the victims are the ones that must be blamed. Those darn humans, they have to keep expanding their lifestyle, taking up more space, using up more resources like water, spreading out across the land for more open spaces, so they have to burn fossil fuels in inefficient over-size cars to get from one place to another, eating inefficient foods like meat that takes up more land to grow and graze on. They have to be managed and reined in, their lives better planned. The freedom of these individuals has to have limits put on it, for the good of the community as a whole. Look, they are causing global warming, climate disaster, and even extinction of whole species, filling up the planet with their hordes of badly-behaved exuberant children, filling the atmosphere with their foul gases, like carbon dioxide. To manage the individuals, for the good of the community, a program must be put in place to regulate their uses of energy, and hem in their expansionist land-use impulses. A new consensus has to be promoted, where they will be “persuaded”, for the good of society, to live in more concentrated, pack-em and stack-em housing, trade their cars in for public transit and bicycles, get their entertainment from mass media, and shop in larger, more efficient, retail centers. Their food has to be manufactured in the most efficient, genetically-modified ways. The education of their children has to be standardized for better social harmony, and their health-care rationed to encourage them to be responsible for their own well-being. And they need to radically conserve their consumption of air, water, and food to benefit the community as a whole. After all, they have brought the whole planet to a point of crisis. Of course, they can’t be trusted to conserve enough, so their environment has to be engineered and regulated. The oceans will be seeded with iron to promote algae-bloom, which will capture the excess carbon dioxide and take it to the bottom. 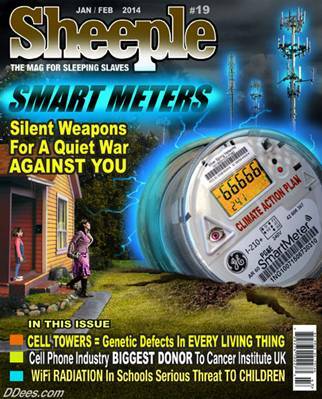 The atmosphere will be seeded with metals and other materials, so that directed-energy devices like HAARP can manipulate the jet stream and control the climate for the common good. The metals in the atmosphere will also act as an efficient medium for the transmission of communication wave-energies between cell phones and smart-meters, in a grand network of regulation and control. As the metals and other materials are breathed by the humans, their bodies will also become nodes on the network, for more efficient communication and control. Society will become more predictable and less dangerous. See? It all makes sense. No need for any fancy conspiracy theories, just one great system modulating itself for the common good. And if the metals you are breathing get into your blood and cause health problems, there is still a buck to be made by the managed health-care industry before turning you over to the undertaker. And of course the less of you, the better for this poor, over-taxed planet. It’s the greatest good for society as a whole, for a healthy well-regulated community. It’s Agenda 21, global in scope, supported by scientific wisdom, to evolve the human race into something beyond our chaotic individualistic “freedom”, to something more trans-human. Besides the freedom to know the truth, our most precious freedom is our health. We can lose our money, our guns, our land or possessions, but if we have our health taken away from us, we have truly lost our freedom. Because of the abovementioned technological advances, it is no longer necessary to load us onto cattle cars or take our guns away to take away our health and freedom. We can be reached in our own homes, we are all part of the grid.